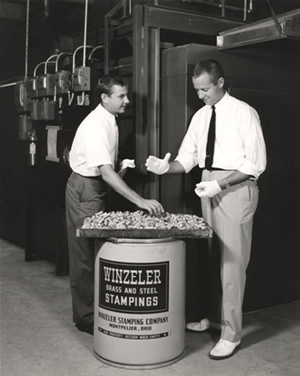 The Winzeler Stamping Company started in 1919, not with a stamping - but with an idea. D.W. "Uncle Dan" Winzeler, one of six children and known to be an itinerant mechanical idea man around Northwest Ohio, had a friend in the furniture business, Mr. Fred Green, (Mr. Green would later become Governor of Michigan in 1927.) Mr. Green's company was the Ypsilanti Fibre Furniture Company in Ionia, MI and they made wicker, fiber and reed furniture. Dan's idea was for a metal brace to replace one made from round wooden dowels which had to be heated with hot water or steam and bent by hand. His metal brace, he reasoned, could be manufactured and delivered ready for use; it would also be stronger and less expensive. The brace would be used on reed furniture manufactured by the Ypsilanti Fibre Furniture Company. Mr. Green had faith in Dan's talents and gave him an order for the steel braces along with a $5,000 check. At the time, Dan had neither a company nor equipment. His brother, Henry, agreed to help Dan, and a partnership was formed in Bryan, OH with Henry providing the space and equipment in the basement of The Ohio Art Company and with Dan handling the sales. This partnership was later dissolved in 1923 when the Winzeler Stamping Company moved to Montpelier, OH in the present location of its Custom Stamping Division. 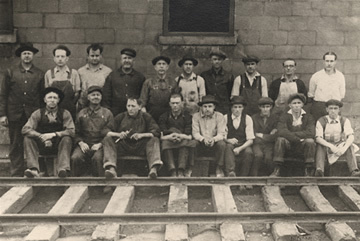 With the Winzeler Stamping Company's move to Montpelier, OH, the 1920's saw an expansion of stampings in and around the furniture industry which was located mainly in the upper Midwest at that time. In the mid 20's, Dan designed a line of steel folding chairs that were produced and sold in very large quantities. At about the same time, as an apparent early proponent of "diversification", Dan saw a need for a tubular steel strap to connect a wooden handle to a farm tool (rake, hoe, hay fork, shovel) and patented a steel strap ferrule in 1925. This steel strap led to the production of the ferrule which continues to be an important mainstay in Winzeler Stamping Company's product portfolio to this day. A third product line evolved in the 1930's - hose ferrules. 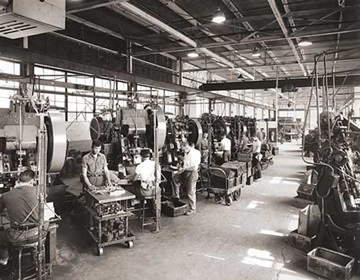 The ferrule expertise that the company had developed drove the hose ferrule product line into the 1940's, and the hose ferrule customers pressed Winzeler Stamping Company to also develop stamped brass and steel hose couplings for garden hose and appliance hose. Again, this diversification enabled subsequent growth for the company to become a recognized industry leader in the supply of lawn and garden hose couplings and ferrules. During the World War II years of the 1940's, the company moved into war-related products that fit the tooling and equipment. For example, millions of tent pole ferrules for "pup tents" were produced, as well as Zippo lighters, a staple of the soldier / smoker. Ferrules and couplings carried the company into the 1950's. Late in the decade, furniture leg ferrules (in brass, aluminum and steel) became the "fashion of the times" and Winzeler Stamping Company became the number one source for these products, selling millions of brass furniture ferrules to industry leaders including RCA, Philco, Motorola, G.E. and many furniture and dinette companies. During the 1970's with furniture ferrules representing a commanding percentage of the company's sales, the company founded or acquired four companies making metal products for the furniture industry. 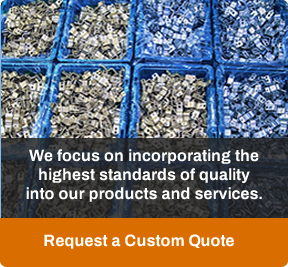 In the 1980's, the company turned its focus more toward higher quality stamping work and custom engineered stampings, primarily directed toward automotive and automotive "type" customer applications. This increased emphasis on technology and quality continued unabated into the 1990's and continues today as companies compete in a global marketplace for increased growth. With increasing global competition and higher expectations for improved quality, reliability, performance, delivery and lower costs, Winzeler Stamping Company's efforts are focused on continuous improvement and innovation. From a customer needs perspective, our thrust is toward providing customer solutions-better, faster, cheaper.